What does the MSF Access Campaign do? "As a person living with HIV the most fearful thing is when you hear that the drug is not gonna be found... It’s just like putting a rope and tying it on a neck of a person"
MSF’s medical teams tell us about patient needs. We respond by analysing the barriers to providing treatment and look for solutions. We work to make necessary treatment affordable, available and adapted to the places where MSF works. We also keep a close watch on medical advances and see how these can be brought to people receiving treatment in our projects and beyond. We focus on medical challenges with the greatest impact on the people we care for, such as tuberculosis, and immunisation. But we also look at neglected diseases and other unmet needs our teams confront. Additionally, we use analysis and advocacy to bring change to intellectual property and trade policies that block access to medicines, and to drive medical research & development that responds to the health needs of the communities we serve. 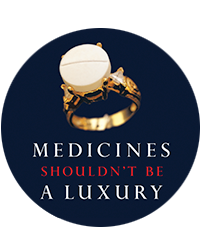 Too often, profits are prioritised over people, blocking greater access to medical care. More support means more power to achieve change. Explore our current campaigns below, and sign up to help expand people’s access to treatment, testing and vaccination. Join us in demanding change by sharing our content.